PART A. TECHNIQUES. 1. Sampling, Sample Preparation, Extraction and Clean-up (V. Betina). Introduction. Sampling and Sample Preparation. Sample Extraction and Clean-up. Illustrative Example. Conclusions. 2. Techniques of Thin Layer Chromatography (R.D. Coker, A.E. John, J.A. Gibbs). Introduction. Clean-up Methods. Normal Phase TLC. Reverse-phase TLC (RPTLC). High Performance Thin Layer Chromatography (HPTLC). Preparative TLC. Detection. Quantitative and Semi-Quantitative Evaluation. Illustrative Examples. Conclusions. 3. Techniques of Liquid Column Chromatography. (P. Kuronen). Introduction. Sample Pretreatment. Column Chromatography. Mini-Column Chromatography. High-Performance Liquid Chromatography. Conclusions. 4. Techniques of Gas Chromatography (R.W. Beaver). Introduction. Resolution in Gas Chromatography. Extracolumn Resolution. Conclusions. 5. Emerging Techniques: Immunoaffinity Chromatography (A.A.G. Candlish, W.H. Stimson). Introduction. Immunoaffinity Chromatography Theory. Practical Aspects and Instrumentation. Sample Preparation. Illustrative Examples. 6. Emerging Techniques: Enzyme-Linked Immunosorbent Assay (ELISA) as Alternatives to Chromatographic Methods (C.M. Ward, A.P. Wilkinson, M.R.A. Morgan). Introduction. Principles of ELISA. Sample Preparation. Instrumentation and Practice. Illustrative Examples. Conclusions. PART B. APPLICATIONS. 7. Thin-Layer Chromatography of Mycotoxins (V. Betina). Introduction. Aflatoxins. Sterigmatocystin and Related Compounds. Trichothecenes. Small Lactones. Macrocyclic Lactones. Ochratoxins. Rubratoxins. Hydroxyanthraquinones. Epipolythiopiperazine-3,6-diones. Tremorgenic Mycotoxins. Alternaria Toxins. Citrinin. &agr;-Cyclopiazonic Acid. PR Toxin and Roquefortine. Xanthomegnin, Viomellein and Vioxanthin. Naphtho-&ggr;-pyrones. Secalonic Acids. TLC of Miscellaneous Toxins. Multi-Mycotoxin TLC. TLC in Chemotaxonomic Studies of Toxigenic Fungi. Conclusions. 8. Liquid Column Chromatography of Mycotoxins (J.C. Frisvad, U. Thrane). Introduction. Column Chromatography. Mini-Column Chromatography. High Performance Liquid Chromatography. Informative On-line Detection Methods. Conclusions. 9. Gas Chromatography of Mycotoxins (P.M. Scott). Introduction. Trichothecenes. Zearalenone. Moniliformin. Alternaria Toxins. Slaframine and Swainsonine. Patulin. Penicillic Acid. Sterigmatocystin. Aflatoxins. Ergot Alkaloids. Miscellaneous Mycotoxins. Conclusions. References. Subject Index. This work comprises two parts, Part A: Techniques and Part B: Applications. In Part A the most important principles of sample preparation, extraction, clean-up, and of established and prospective chromatographic techniques are discussed in relation to mycotoxins. In Part B the most important data, scattered in the literature, on thin-layer, liquid, and gas chromatography of mycotoxins have been compiled. Mycotoxins are mostly arranged according to families, such as aflatoxins, trichothecenes, lactones etc. Chromatography of individual important mycotoxins and multi-mycotoxin chromatographic analyses are also included. 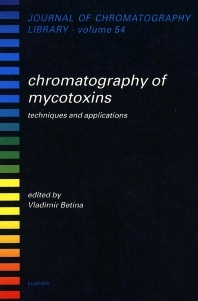 Applications are presented in three chapters devoted to thin-layer, liquid, and gas chromatography of mycotoxins.